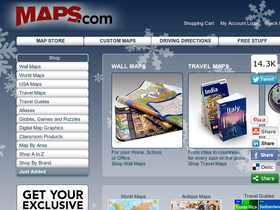 Visit Maps online at Maps.com which carries 10,000 products, including Wall Maps, World Maps, USA Maps, Custom Radius Maps, Travel Maps, Travel Guides, Atlases, Globes & Games, Digital Map Graphics, Map Software, Classroom Products, Map By Area, Online Business Mapping, Shop By Brand, NG Classic Maps and Personalized Map Prodocts. Save on your next purchase from Maps.com with discounts, coupons, promotions and savings from 58coupons.com. Enjoy Free Shipping on all orders over $59 or more from Maps.com with this coupon code. Save 20% on all orders of $100 or more from Maps.com with this coupon code. Receive $10 OFF all orders of $70 at Maps.com with this coupon code! 5% savings on all orders from Maps.com with this Promo Code. Check out the free iPhone applications at Maps.com. Click link then click on free stuff to get them. Head on over to Maps.com to play some free map games. Click link then click on free stuff to go there.